Remember the old-fashioned gelatin salads with embedded mystery fruits and vegetables that great-aunts inevitably brought to Thanksgiving dinners? Well, I’ve found one of those old recipes. 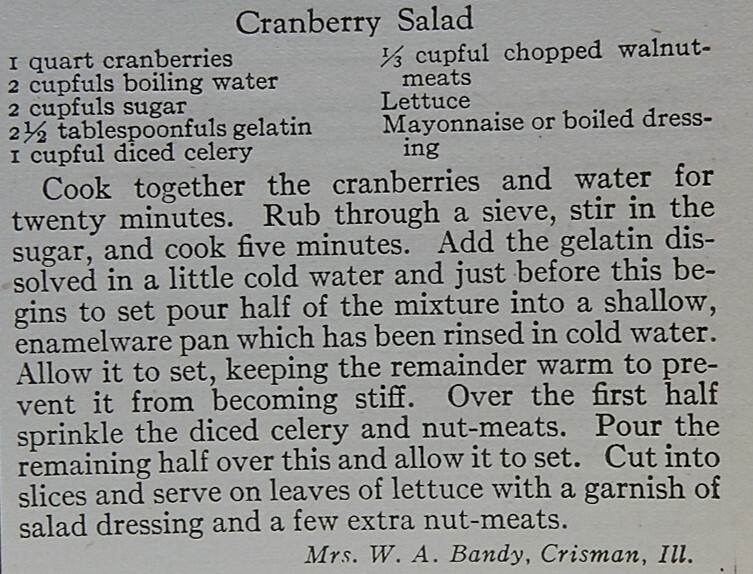 The hundred-year-old Cranberry Salad recipe called for gelatin — and celery and walnuts. When I made this salad I didn’t want to like it, but I was pleasantly surprised. It tasted similar to jellied cranberry sauce. The colorful, tart jellied sauce was perfectly punctuated with the crunch of the celery and walnuts. I bought a 12-ounce bag of cranberries to make this recipe. When I measured how many cranberries were in the bag, I realized that I only had 3 cups of cranberries, not the 4 cups (1 quart) called for in the old recipe. I reduced all of the other ingredients proportionately and made three-fourths of the original recipe. Put cranberries and 1 1/2 cups water in a medium saucepan, bring to a boil using medium heat, then reduce heat and gently simmer for 20 minutes while stirring occasionally. Remove from heat and cool slightly, then press the cooked cranberries through a sieve or strainer. (I used a Foley mill. A food processor could also be used to puree the berries). 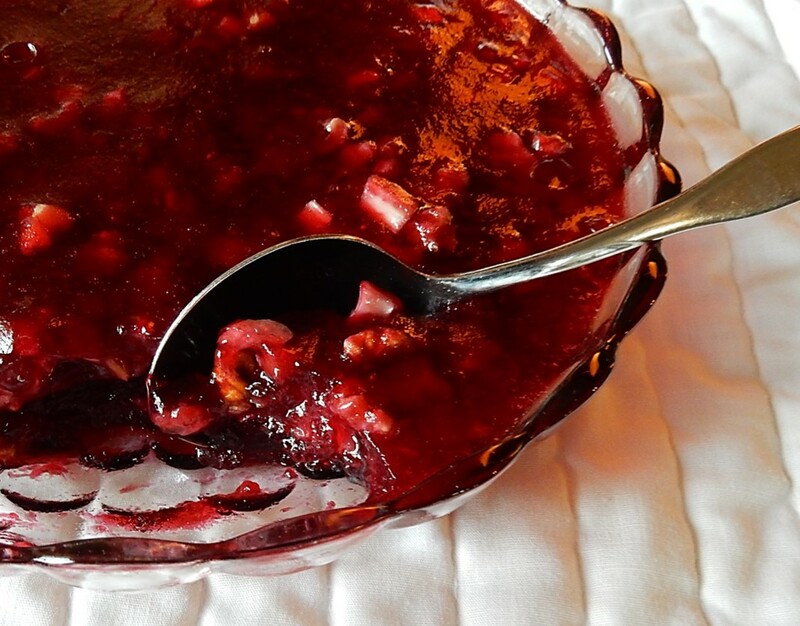 Return the cranberry sauce to the sauce pan and sprinkle the gelatin over the puree. Let sit for one minute, then add the sugar and stir. Put on the stove and bring to a boil using medium heat while stirring constantly, then reduce heat and cook for an additional minute. Remove from the heat. Put half of the cranberry sauce into a serving dish or bowl; refrigerate until just set (about 1 1/2 hours). (Keep the remainder of the cranberry sauce at room temperature.) Remove the set cranberry sauce from the refrigerator and sprinkle with the chopped celery and walnuts. Pour the remaining half of the cranberry sauce over this , and return to the refrigerator until set. I used a Foley Mill to make the Cranberry Sauce. It worked well, but a sieve, strainer, or food processor could also be used to make the sauce. Posted on November 13, 2016 November 13, 2016 by SherylPosted in FoodTagged cranberry, recipe. I love anything with cranberry so I would taste this if someone brought it to my house. Cranberries are one of my favorite fall fruits. I’d have skipped the mayo too. Actually, this sounds pretty good with the crunch of the celery and walnuts. It was really nice. The crunch of the celery and walnuts definitely added to it. I love the clear jelly you’ve made – much better without the mayo in there. I think that you’d like it. It’s a very nice cranberry dish. My mother would be proud if I did! Ha! This was a really nice dish, and one that I’ll definitely make again. If you try it with the mayo, you’ll have to let us know whether the mayo added to (or detracted from) it. This one was a family standard — with mayo, thank you. Easy on the celery, a few extra nuts, and everyone was happy. It’s actually quite good. Your comment made me smile – and it made me want to try this dish with a little mayo. This sounds so good! These kinds of salads always remind me of potluck dinners at church! Fond memories. Gathering together over food facilitates the creation of so many wonderful memories. Cranberry, celery, and walnut make it very healthy! Yes, this is a nutrient-rich dish. These kind of recipes are out of style now but they were my grandmother’s favorite. I love cranberries! It’s intriguing how certain foods wax and wane in popularity across the years. I know. Sometimes I will make something from an old cookbook and for some reason, no one is interested. Tastes change over time, perhaps? Yes, I think that you’re right that tastes change over time. Sometimes I wonder which foods that are popular today will be out of style fifty or a hundred years from now. I notice that tastes change gradually, so it’s hard to notice. My mother jokes that “sushi is the new gefilte fish.” I think she’s right. 🙂 I love the analogy. Your comment about celery and walnuts made me think about how Waldorf Salad also has both celery and walnuts (plus apples and a few other ingredients). This takes me back! My youth was littered with this kind of salad! I would definitely eat and make this at Christmas. Love the idea of a savoury jelly. This would be lovely for Christmas. I agree – it’s very good. It’s fun to hear that your mother makes this recipe – and that it may have been passed down from her mother. I liked them, too. Sometimes I think that I should buy a mold so that I could try making some of the old molded recipes. Great idea. Can be made with many varied ingredients…yum. Yes, this recipe would be easy to adapt. It’s so much fun to try various combinations. I’m never quite sure what to expect when I try a hundred-year-old recipe. I was pleased with how this recipe turned out. Thanks for reminding me of my mother-in-law’s special salad. I think I’ll make it this year in her memory. It’s nice to hear that this recipe brought back memories of your mother-in-law’s salad. I think my mom used to make this. There is a bitterness to both walnuts and cranberries which works well together. They do work surprisingly well together.